Lips are one of the most beautiful and attractive parts of the body. And thus it needs to be taken proper care of. 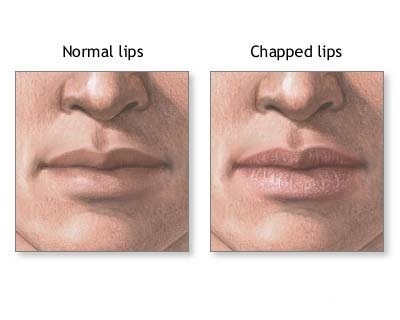 A chapped lip not only looks ugly but also causes pain and discomfort. Chapped lips are usually characterized by dryness, peeling of the skin on the lips, which may sometimes cause them to bleed and is painful. Though there are a couple of cosmetic products and lip balms available in the market which can easily help us in getting rid of it, but the best way is to go for home remedies as Grandma’s home remedy has always been effective without any side effects. Secondly, this form of treatment is suitable and effective to everyone. For the lip balms available in the market give temporary relief only. What we need is permanent relief thereby softer lips than before!! 1) Foremost of all, properly hydrated lips rarely get chapped. So, wateris the first priority for a good skin & lips, of course. 10-12 glasses of water a day is the basic thing you need to do. 2) Coconut Oil - the most natural & the most reliable remedy for this purpose is applying coconut oil every morning and at night, before going to bed. Not just applying it will solve the purpose completely, gently massage your lips and the surrounding skin. You can also increase the number of times you use coconut oil for the purpose. If it suits your skin, there could be nothing better than this!! 4) Vaseline - Get some good natural vaseline, if available. 5) Change your Lipstick - Your lipstick might be causing allergic reaction. Try changing the brand; or color you are using presently; or avoid its use, if possible. 6) Some also say, applying the fleshy side of tomato works, though it stings earlier, but later on it helps in the speedy recovery. 7) Fill a shot of olive oil, dip your finger in it and apply it on your lips and drink the rest of it. 8) Rub a slice of cucumber on your affected area. Many people have found this and effective method. 9) Another method is to apply honey and rose water on the lips and massage them for a few minutes. Then wash it off with fresh water after 15 minutes. 10) Lay a finger alongside your nose and rub it in circular motion around your lips. This may help to pick up the natural oils which your lips are looking for. Things you need to take care of :Have a dentist readjust ill-fitting dentures, for that might also be the cause. Toothpaste - Also, your toothpaste or mouthwash be the cause behind it. Try changing it for a few days and replace it with a milder one.